So, 10 days into the new year, and already, I have broken my pattern moratorium. But really….can you blame me?? 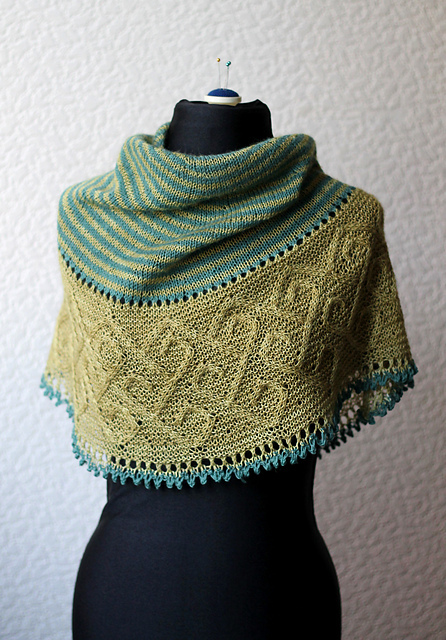 This entry was posted in Uncategorized and tagged carradal, lucy hague, patterns, shawl by Rayna. Bookmark the permalink. Great shawl. Not sure why I can’t get to the comment section on this post? Hey Val…not entirely sure yet. I am planning to ditch the stripes, though…and do a solid/variegated top and then a solid cable section. And every now and again, after I hit “Post” WordPress seems to revert me back to an old version. I could not even find this post earlier….it was back in draft mode. Looks like I will have to start testing these after posting.